Yikes! Christmas is coming too soon! Where did the time go? Eek! No time for a flowery introduction. Gotta make the donuts! Let’s jump right in. This recipe makes about 20 donuts. Sift the flours, baking powder, salt, nutmeg and cinnamon together into a medium bowl. In a mixer fitted with a paddle attachment, add the shortening and the sugar. Mix on slow until the mixture resembles coarse sand. Add the egg and mix on slow until well combined and uniform in color. Add the potato, a third of the flour mixture and a third of the milk. Mix on slow until just combined. Scrape down the sides of the bowl. Continue adding the flour and milk in intervals. Stop when just combined. Try not to over-mix. Transfer to a shallow casserole dish that’s been coated with cooking spray. Press the batter down to an even layer. Cover and refrigerate for at least 2 hours and up to 24 hours. Heat 3 inches of canola oil to 360 degrees in a fryer or a heavy pot. Turn the dough out onto a floured surface. Sprinkle the top lightly with flour. Pat the dough down to a ½-inch thickness. Cut out donuts and donut holes. Gather dough remnants into a ball and pat down again to make more donuts. Carefully slide 2 or 3 donuts at a time into the oil. As soon as the donuts float, flip them over using two chopsticks. Cook until the underside is lightly browned (about 40 seconds). Flip and cook the other side to golden brown (about 30 seconds). Transfer completed donuts to stacked paper towels. Be sure the oil is at 360 degrees again before frying another batch. Make sure all donuts have cooled to room temperature before icing. This recipe explains the homemade donut making process in rather simple terms. Refer to the end of this article for more detailed instructions. 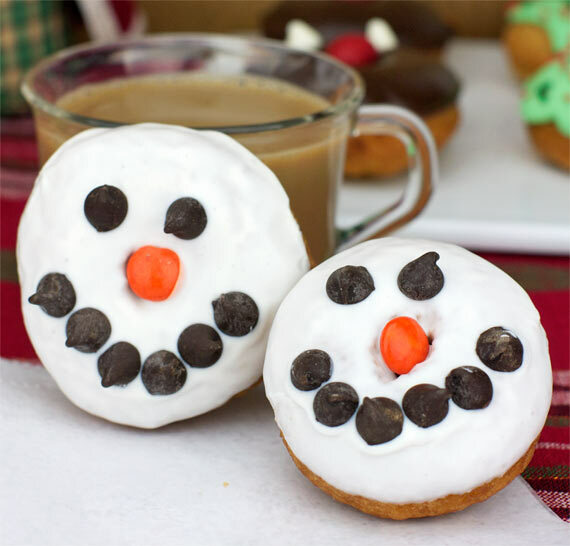 For these snowmen donuts, I used a simple vanilla icing. 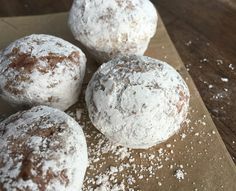 You can get the recipe for that (and some icing tips) from a post I did a couple weeks ago called Christmas Cake Donuts: Chocolate With Crushed Candy Canes. The mouth and eyes are chocolate chips and the nose is a Reese’s Pieces candy. I made snowman faces. If you wanted to make a full snowman body, just ice 2 donuts with no other decoration and use those to make a body for your snowman face. To make these, I used the leftover vanilla icing from the snowmen and stirred a couple drops of green food coloring into it. To make the flavor more interesting, I stirred in a handful of melted white chocolate chips. Instead of dipping the donuts in the icing, I put the icing in a piping bag and applied it that way. Green and red jimmies added a beautiful final touch. Combine the butter, milk, corn syrup and vanilla in a small sauce pan over medium heat. Stirring often, cook until butter is melted and ingredients are combined. Reduce heat to low and add the chocolate chips. Stir until the chocolate has completely melted. Add chocolate mixture to powdered sugar and whisk until very smooth. If icing thickens over time, add more liquid to thin it out. 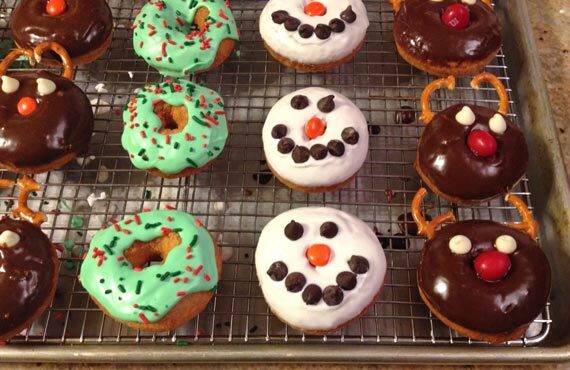 For all these donuts, make sure you adhere the decoration (eyes, sprinkles, etc.) before the icing has a chance to set. (I keep my bowls of icing warm over pans of hot water so I’ll have plenty of time to work before the icing hardens.) 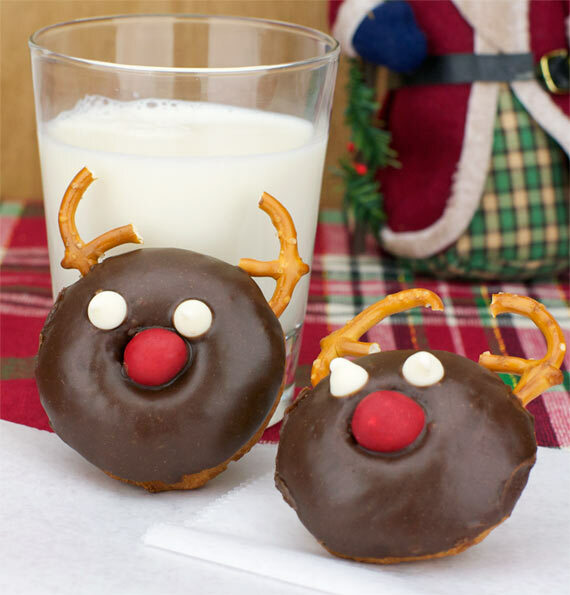 The only exception is the reindeer pretzel antlers. I let the icing completely set on those so I wouldn’t smudge the icing while poking the pretzels in. I hope you’ll have fun making your own Christmas cake donuts. 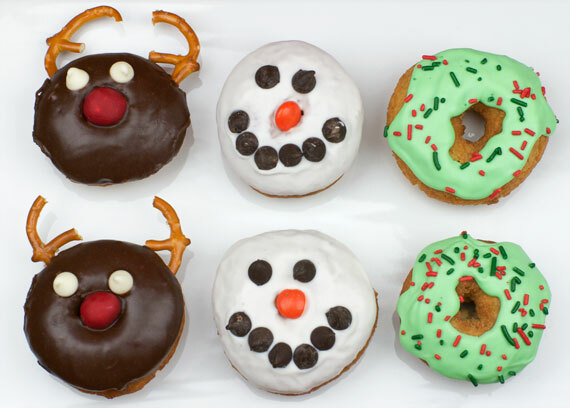 May your days be merry and bright… and may all your Christmas donuts be white… snowmen, green wreaths or chocolate reindeer! 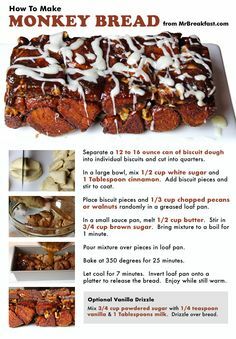 If you have it, try replacing 2 Tablespoons of the all-purpose flour with soy flour. With that that small amount, you’ll notice that the donuts absorb less oil when they fry. I suggest having your better chill in a casserole dish rather than a bowl (as other recipes tend to advise). This is so that the dough is already partially flattened and shaped when you turn it out later. The less you have to work the dough right before frying, the better your chances of success. 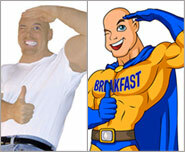 When cutting donuts, I uses a 2 and 1/2 inch biscuit cutter to make the donuts and a 1-inch cutter to make the holes. I have a small bowl of flour near my work station and dip the cutters into the flour between cuts to prevent sticking. I like to cut the dough in two batches, so half of the dough remains chilled and firm in the refrigerator as I work the first half. Once the donut batter gets warm, it becomes sticky and difficult to work with. 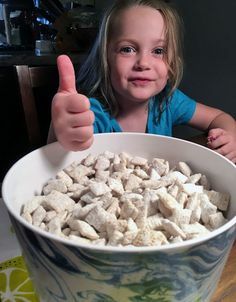 When you gather the dough remnants to get more donuts from the scrap, you’ll need to incorporate a bit more flour for the dough to be workable. Add only as much as you barely need. If you add too much flour, the donuts become more biscuit like in texture. However, they they will still taste great and look as pretty as the first batch when they’re decorated. When frying, be sure not to overload the fryer or pot. If it’s a large pot, you can certainly make more than 2 or 3 at a time. I like to use a 10-inch x 12-inch Le Creuset French Oven cast-iron pot which comfortably cooks 4 donuts at time. I flip my donuts in the oil using 2 chopsticks. It’s the best tool for the job, but a couple of table knives work fine as long as you work quickly so they don’t get hot. To remove the donuts from the oil, I like a wire skimmer – a kitchen tool that looks like a small basket attached to a handle. Metal tongs will work if you don’t have a skimmer. I’ve tested the recipe above dozens and dozens of times. I actually wear a stop watch around my neck because I’ve become extremely confident in the cooking times detailed. When you start making donuts at home, you’ll have a tendency to want to overcook them – to feel safe that the insides cooked through. Rather than overcook them, try the recommended times, make a batch and then rip into one donut from the first batch (when cool enough to touch). You’ll find the inside fluffy and completely cooked. Beware of other cake donuts recipes that list frying times in minutes rather than seconds. 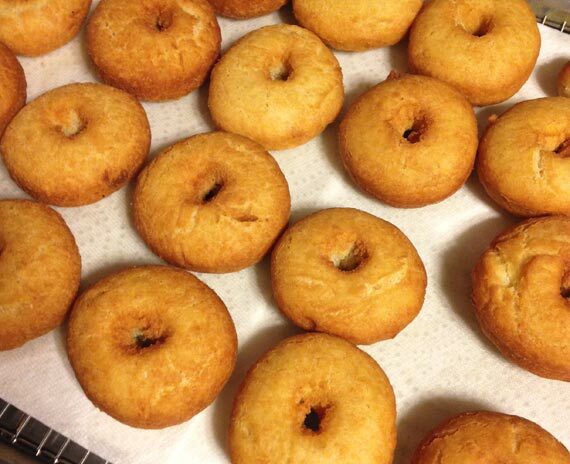 Over-frying makes crusty, dry donuts. 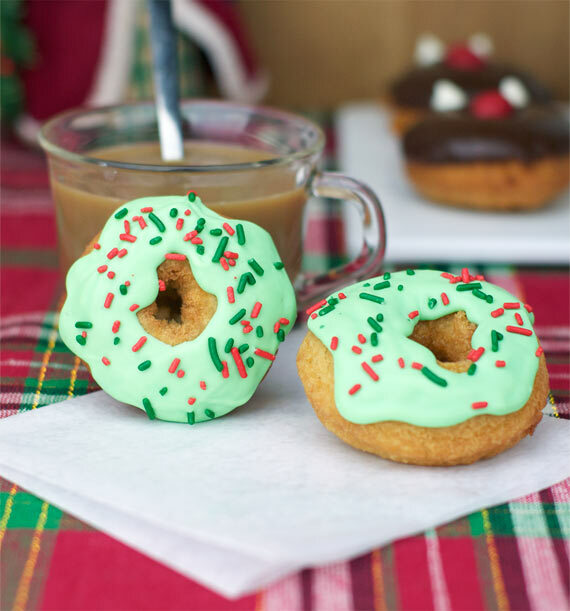 The only difference between this Christmas Cake Donut recipe and the cake donut recipe I use for other applications is a slight increase in the amount of cinnamon. For the icing, I stir 1/4 teaspoon of meringue powder in with the powdered sugar. That ingredient isn’t required, but it does help the icing set firmer. you’re just too clever! maybe that’s a diet secret, who’d want to eat such cute snowmen and reindeer! ?